I thought saying I would show you my Altoids Tin Shrine in my next post would help motivate me to finish it. I was wrong. I think it de-motivated me. There were other things getting in the way, too, of course. There was the Will McLean Festival – the very first three-day festival my daughter and I attended without any additional family along to help out. We camped in a tent for four nights, all by ourselves, and were responsible for all the campsite set-up and booth set-up. At this festival, they let vendors camp right behind their booths, so we were only a few steps away from all our supplies while we were busy selling tie-dye all day long and into the night. That was a bit of a surprise. The application form had told us we were required to be open until 5:00 pm, which sounded reasonable enough. It didn’t tell us that most of the other vendors would be staying open until 9:00. Vendor’s row was right next to the main stage, so we had enough light to stay open late, with the addition of a couple of battery-operated lanterns. I think we stayed open later Friday night than Saturday. By Saturday we had learned that night audiences are more interested in the music than the shopping. That was fine with us; we prefer to sell in daylight, anyway. We had a good time at Willfest, but it was three hundred miles from home and we were worn out when we finally got back to Jacksonville. Then we had to get ready for another festival the following weekend. Fortunately, it was just a one-day festival in White Springs, so there was no tent camping involved. We were able to spend the night before and the night after the festival with my sister, who lives in White Springs. That was a delight – especially when compared to five days and four nights of tent camping the week before. These two festivals gave us enough cash to order some much-needed blanks, so they were definitely worth the effort, but I didn’t think about anything but tie-dye, tents and travel for two solid weeks. When I tried to go back and finish my Altoids Tin Shrine, I just couldn’t figure out what it needed. I had already put gobs of pink paint and glitter on it, because I knew that would make Ruthie happy, but the inside needed more than just glitz. Ruthie loves magic and she loves pink, but she also loves nature. I started fiddling with an outdoors-y background and I finally came up with something that pleased me and Ruthie – blue sky, green fields, yellow flowers and a white picket fence. I wanted Ruthie in the scene, so I printed an old photo and colored it with watercolor crayons. Of course, Ruthie wanted fairy wings, so I used wire and organza to make some for her and then I put little Ruthie in with the flowers and grass. The deeper side of the tin was complete. The other side needed some magic. I decided to make a wand, but it was Ruthie’s wand, so it had to be pink. As you can see in the picture, it’s a bit lopsided, but what do you expect from a four-year-old? I wanted some Ruthie attitude on this shrine, too, so I added the words she would be most likely to say, “Come on, come on! It’ll be fun!” Ruthie is an adventurer. Here’s the tin. The perfectionist adult in me sees lots of imperfections, but Ruthie loves it. She may have gone overboard with the glitter. 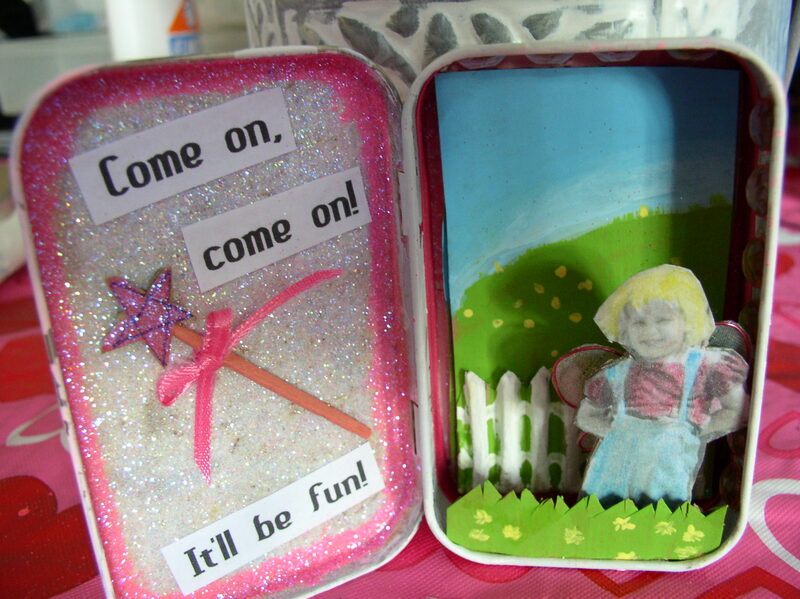 This entry was posted in Uncategorized and tagged Altoids tins, creativity, tie-dye on March 26, 2013 by releaf1954. Right. Yes. Of course. I would get together with my sacred circle of inner children and we would come up with a plan. We would light candles. We would burn incense. We would sing the theme song (yes, there’s a theme song. How could there not be a theme song?) A good time would be had by all and a project would be chosen. A project was chosen, actually. Chosen and begun, but then life intervened, as it often does, and I had to put the glitter away for a while. There was a surprise trip to St. Louis and then there was a long weekend of babysitting my grandchildren and then…well, then I was exhausted. The project is not finished but I don’t want to put off the third blog post until it is. Yes, the whole purpose of the blog is to motivate myself to make stuff but I don’t want the blog to become just one more creative thing I’m dreaming about and not doing. I want to do this one. Let me mention the other things I want this blog to help me do. I want to make an art quilt. I want to make an art doll. I want to paint at least one 16” x 20” canvas. These are the three things I’ve been dreaming of doing for years and not doing. The big three. I also want to do fifty things, total, before my next birthday. I don’t know what the fifty things will be except that they include the big three. They will also include other, smaller things. A page in my art journal counts. Any kind of drawing counts. A new song, a new poem, a short story or a novel (!) would also count. If it’s the least bit creative, it counts. I know there are people out there doing a drawing every day and they might think my goals are not very ambitious, but they don’t know how stuck I am or how long I’ve been stuck. I want goals that feel challenging but achievable. For starters, the girls and I have decided to make tiny shrines in Altoids tins, one for each of them, beginning with the youngest. That’s the project I started before life got in the way – a shrine for little Ruthie, the preschooler who loves pink and believes in magic. I’ll show you that the next time I post. Meanwhile, if you’d like to pleasantly waste a few hours on the internet, google “Altoids Tin Shrines”. There’s some gorgeous stuff out there. This entry was posted in Uncategorized on March 3, 2013 by releaf1954.